At the end of the final episode of Hoozuki no Reitetsu 2nd Season on Sunday, it was announced that the season will be a split cours. 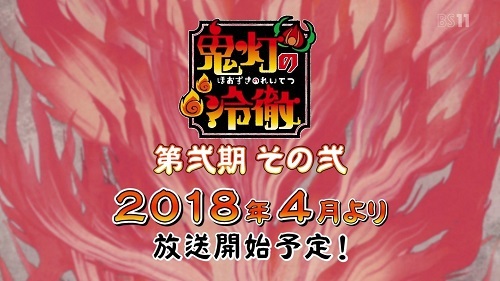 The second part will be titled Hoozuki no Reitetsu Dai Ni Ki Sono Ni (Hoozuki no Reitetsu 2nd Season 2nd Part), and will broadcast in Spring 2018. Hoozuki no Reitetsu has been serialized in Morning magazine since March 2011 and currently has 25 volumes in print. Wit Studio adapted the first season into a 13-episode TV anime in Winter 2014. Four OVAs were bundled with 17th, 18th, 19th, and 24th volumes of the manga between February 2015 and March 2017 before Studio Deen took over the sequel this season. Kinda not surprised we would get more because i know that its a pretty big deal in japan but thats great news to see more coming so soon ! This has lifted my spirits greatly. One of my favorite comedies is coming back in a few months. YES!!!! SEIZON SENRYAKU: Hungry 100% of the time. I need to give this a chance sometime x.x but hey that's pretty good news. One of my fav comedies, I'm so glad to know that there will be more of it!!!! Nice, it's a pretty chill series, despite being about hell. YEAHHHHH! This show is great! Check out the News Club for daily rankings, discussion on future CD and BD releases, manga and novels. New members are welcome! Split cours was a thing again? Damn that's giving me a splitting headache! But they are all dumb asses who always love to bother unnecessarily. "Spread the Hate, Spread the Idiocy." I know right? Can't we just call them new seasons? I mean what's easier to say; I can't wait for "insert anime names" 2nd seasons 2nd cour! or 3rd season? Crying doesn't mean you're weak. Enduring doesn't mean you're strong. one of my favorite comedies! I know. I just don't know how to word it when talking about release of OVA and two different studios. Yeah, But you know what's more troubling? MAL gonna treat it as a separate season. And the effect of that on episode numbers would be disastrous, it would be horrible! Just whats gonna happen when the committee/studio do another season and name it Third Season? That's very true. It's similar to how I had to explain to multiple people that the new season of Fairy Tail is indeed its third season. Even though Hulu says there are 8 seasons there are only 2 in Japan. It makes it super confusing. And what is the point of splitting the season in the first place? Besides to confuse and annoy everyone I can't see the point. To take a break obviously. They can't do that every week on one show. Because the staff, voice cast and the studio wasn't just doing one show. It would be like hell if they run out of time before a new episode was scheduled to be release but it wasn't finished yet. The product would get ugly. The problem here was MAL, there's no point on splitting it for two entries on the database. They are just gonna confuse people. The anime will broadcast on Saturdays at 25:00 (Sunday 1:00 a.m.) via Tokyo MX, followed by Sun TV, BS11, KBS Kyoto, and AT-X starting April 7 (April 8 midnight). AbemaTV and other unannounced online websites will also make anime available online.